Why should you know how to manage arrays? When you search for elements in your HTML document, even if you find one element (or zero elements, for that matter), you nonetheless get back an object that contains an array of elements. In the zero-element scenario, your result is an object with an empty array; you don’t get back a null variable, as some people might expect. This code provides the “on” function with two arguments: the name of the event to handle (click) and a function to call in response to that event. Look at how there are two arguments given to “on,” and that the second argument is a function. The code for jQuery’s “on” function assigns this event to all the elements it finds that are of class .clickable. How does it know which elements? The object you got back from the first call to jQuery returned an object that includes a member function called on. The code inside that member function has access to the object, including the array that contains the selected elements found in the first call. 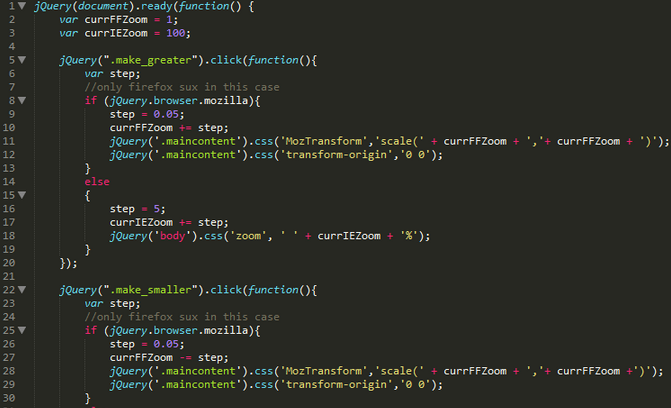 Understanding the mechanics of this is vital to truly understanding jQuery. Familiarize yourself with the functions available. For example, know that there are different ways to find the parent of an element, such as parents() and closest(), and understand the difference. Understand when the document is finished loading and how to write code that safely access the elements only after the document is loaded. There are several ways to accomplish this. Learn CSS selectors. This is vital, because it’s through CSS selectors that you use jQuery to locate your elements. In addition, you should know how to use the browser debuggers, especially Firebug and Chrome’s debugger. (IE has a decent debugger, and you’ll need to know how to use it when porting to IE.) Learn how to set breakpoints inside your callback functions, and the order in which code gets executed. For example, depending on the situation, the “on” function that assigns a function might get called immediately, but the code in its event callback won’t get called until the event takes place. Any code immediately following the “on” function will get called immediately after the function is called, again, likely before an event takes place. You can see this in action by setting breakpoints in the debugger: one on the line before your “on” call, one on the “on” call itself, one inside the callback, and one immediately after the “on” call. You should also know about available plugins. This is a bit of a loaded statement, however, because in addition to the official jQuery plugins (jQueryUI), there are thousands of free third-party plugins (which is one reason jQuery is so popular) that can accomplish nearly anything. Finding them requires searching, which is okay: you can save lots of time by searching for a plugin before attempting to create one yourself. When you find one, test it out thoroughly to make sure it really does what you need, and that it actually works well without bugs. There are so many little tricks to jQuery, from keeping the document from “flashing” before plugins kick in to modifying the look of the elements. You can learn about many of these via online search, but the hard part is figuring out these tricks even exist. By looking at the code of other websites, you can discover quite a few that will prove useful. Is Rapid Mobile Development Worth Your Time?